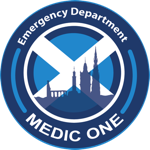 I am a ST5 Emergency Medicine trainee in Edinburgh, Scotland. After receiving the Robin Mitchell Travel Fellowship, I have been given a fantastic opportunity to explore the Pre-hospital and Emergency care services in Oslo, Norway. The Robin Mitchell Travel Fellowship was set up to commemorate Dr Robin Gordon Mitchell, an Emergency Medicine Consultant in Edinburgh and is open by application to all Scottish Emergency Medicine trainees to pursue a 4-6 week placement away from their base hospital, within the setting of Emergency Medicine or another associated clinical specialty to enhance their clinical experience and expertise. As my fellowship sadly draws to a close, this will be my last blog. I will discuss the Emergency Department at Ullevål University Hospital, before summing up the highlights of my fellowship and the experiences I have gained. Ullevål University Hospital is the largest hospital in Scandinavia and Oslo's major trauma centre. In addition to being a major research centre, it has many specialists including cardiology, neurology, neurosurgery, paediatrics, general surgery, psychiatry, infectious diseases, anaesthetics and intensive care and many others. As you may recall from my previous blogs there is currently no Emergency Medicine speciality in Norway. All patients are referred directly to a speciality either via the GP, Legevakten (extended emergency GP service - see my earlier blogs for more details on this), ambulance service or pre-hospital physician services and then seen in the Emergency Department. If the patient is critically unwell, Pre-hospital physicians or ambulance personnel can request a resuscitation call via dispatch for the specialty involved (e.g. cardiology), with an additional anaesthetist and radiographers on standby. For example, in patients with ROSC (return of spontaneous circulation) post cardiac arrest, the Pre-hospital team are met by the cardiology team and anaesthetist at the entrance of the Emergency Department and then either directly transferred for primary PCI (if relatively haemodynamically stable) or to the resuscitation room. Generally all post cardiac arrest patients with ECG changes (regardless of what these are) will go for PCI within the first 48hrs after their cardiac arrest. In major traumas, pre-hospital services request a trauma call which involves a surgical team, anaesthetic team, radiographers and phlebotomist. The most senior surgeon is the team leader, and stands back directing the team whilst the anaesthetist maintains the airway. Ullevål hospital has recently refurbished the Emergency Department. Helicopters land directly on the roof of the carpark and are transported by lift to the resuscitation rooms of the ED. Additionally, patients arriving by ambulance reach the ED through doors immediately outside the resuscitation rooms. The trauma resuscitation room is now directly next door to the CT scanner and an interventional radiology suite, allowing critically ill patients to literally be wheeled next door for imaging or interventional radiology. It has been interesting to compare the Norwegian and UK Emergency Department models. Generally the Emergency Departments in Norway act more like a receiving unit for specialists, with the addition of resuscitation rooms for critically ill patients, as opposed to the British system. Comparing both systems has reinforced my belief that there are many advantages to having doctors specialised in Emergency Medicine - a system which Norway is also considering adopting. In Norway, as doctors are not based in the Emergency Department there is no medical ownership of the department, and if patients become more unwell there may be no doctor immediately available within the department. In the resuscitation room (particularly the medical resuscitations), I sometimes found it far more chaotic, and on occasion there appeared to be limited cohesion between the Physicians, Surgeons, Anaesthetists, and Nursing staff. Additionally, the specialists sometimes appeared more keen to make the diagnosis than managing the initial patient resuscitation through the standard ABC system, (however they do have additional support from the Anaesthetists if the patient is critically unwell). Doing EM training allows you to be open minded to a number of possible differential diagnoses (both surgical and medical), whereas when patients are directly referred to a speciality, it can take longer for the patient to end up in the correct place. Additionally, I think Emergency Medicine doctors have more skills in targeting appropriate investigation and triaging whether patients need to be admitted or discharged with appropriate follow up. Despite this, Norway has a fantastic Pre-hospital and Pre-hospital to hospital interface. Particularly around Oslo, pre-hospital services are more centralised. Oslo University Hospital houses pre-hospital research, the dispatch centre, Oslo's main ambulance stations, the Ambulance Leader (Commander) and Physician Ambulance. Additionally the other pre-hospital centre at Lørenskog, next to Akerhus Hospital houses the helicopter and fixed wing ambulances, a pre-hospital physician car and the main ambulance station for Akerhus. This has allowed close integration between all the different services, and joint multi-disciplinary training sessions, meetings and debriefs are held in both these centres. With regards to the Pre-hospital to Hospital interface, Pre-hospital physicians and ambulance service staff are able to directly request a specialist on standby, and patients can be taken straight from the pre-hospital environment to CT (for example in a potential stroke thrombolysis candidate), theatre, or primary PCI (eg ST elevation MIs or cardiac arrest - a service which is developing in Edinburgh), reducing time to diagnosis and definitive care. After gaining further insight into the Norwegian Pre-hospital and Emergency Medicine models, I have also given a presentation in Oslo University Hospital regarding the services in Scotland, allowing the opportunity for people to learn more about the similarities and differences to the Scottish systems. As my time here draws to a close, I reflect on the fantastic 6 week experience I have had here in Norway. Thanks to the Robin Mitchell Fellowship I have been able to experience firsthand how the Norwegian Pre-hospital, Retrieval and Emergency Medicine services work. From the capital of Oslo, to the remote island of Svalbard, I have been able to gain firsthand experience of working alongside Pre-hospital and Retrieval professionals, working on the physician ambulance, helicopter and fixed wing services, and additionally even learn about transferring patients by boat! I have also had the opportunity to visit the Dispatch centre in Oslo, and spend some time experiencing how the Legevakten (extended GP service/emergency ward operates), in addition to the Emergency Medicine departments in both Ullevål and Rickshospitalet. Attending training sessions for Dispatch personnel, Paramedics and also the Physician Ambulance and Norwegian Air Ambulance has also given me an insight into Pre-hospital training in Norway. This experience has not only increased my knowledge and expertise of managing critically ill pre-hospital and retrieval patients, but allowed me to identify some potential areas which could be integrated both within the Scottish and Norwegian Pre-hospital and Emergency Medicine systems to ultimately improve things for our patients. I would especially like to thank the Robin Mitchell Fellowship Advisory Group, Medic 1 Trust Fund and my supervisors Dr Richard Lyon and Dr Dave Caesar (in Edinburgh) and Dr Theresa Olasveengen (in Oslo). Additionally, I would like to thank all the staff at Oslo's Dispatch centre, Physician Ambulance and Air Ambulance helicopter and fixed wing bases and Oslo's Legevakten, Riskshospitalet and Oslo University hospital who have all been extremely helpful and made me feel so welcome. Newer PostLast chance for Medic One Ball tickets!